Looky! If you go and check out Fear and Parenting in Las Vegas, you'll see that Zoeyjane, Maria Melee, and I made it all purty-like. God bless, Sweet Blog Design. Now, head on over to Fear and Parenting in Las Vegas and tell her how fabulous she's looking these days. 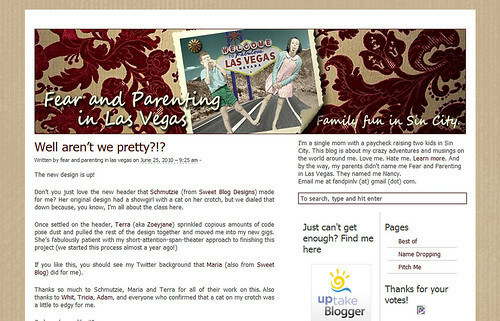 Also, if you're in the market for a weblog facelift, give us a shout at Sweet Blog Design, because we make you look good. We really do.